Posted by Geoffrey Hiller in Pakistan. Lukas Berger (b. 1989, Austria) studied photojournalism & documentary photography in Hanover, Germany and is currently based there. His photographic work brought him to places like Pakistan, Burkina Faso, Uzbekistan, Ethiopia and many European countries. The project Circus was published as a book by the German publisher Kettler and at TIME Lightbox. Lukas is co-founder of the art space/gallery BOHAI in Hanover. Joel Hawksley (b.1990, United States) is a freelance photographer and web application developer based in Providence, Rhode Island. A former newspaper photographer at The Roanoke Times, his clients include The New York Times, The Wall Street Journal, National Public Radio, and AARP. His work has been recognized by College Photographer of the Year, Hearst Journalism Awards, and the National Press Photographers Association, among others. Joel is also the creator of SoloFolio. Posted by Geoffrey Hiller in Indonesia. Luca Catalano Gonzaga (b. 1965 Italy) has a degree in Economics. In 2008 he became a full-time professional photographer, focusing mainly on social issues and portraits. He was awarded the Grand Prix Care du Reportage Humanitarie in 2009 for a feature on child labour in Nepal, which was shown at Visa Pour l’Image. 2010. He co-founded Witness Image, a non-profit association developing photographic projects on human rights issues. Luca received funding from the Nando Peretti Foundation, to carry out the project Child Survival in a Changing Climate (2011) and in collaboration with UNPO (Unrepresented Nations and Peoples Organization), for the project Invisible People (2013). His work has been published in Geo, The Guardian, New York Times and the Washington Post. Luca is based in Rome. Michael Santiago (b. 1980 USA) is a documentary photographer based between New York and Oakland. Michael’s work focuses on issues concerning people of color and their communities; obesity, cancer, race and identity, family relationships, healthy eating, youth empowerment and more. A senior at the San Francisco Art Institute, he studies documentary photography and brings a strong cultural awareness to his work. He is the recipeint of the 2015 Alexia Foundation student grant for his project Stolen Land, Stolen Future a body of work focusing on Black farmers of California and his long term projects A Promise, 250 and Michael. Posted by Geoffrey Hiller in Brazil. Dario Bosio (b.1988, Italy) obtained a degree in Journalism at Florence University and graduated in both TV-Documentary and Photojournalism at the Danish School of Media and Journalism. In 2012, together with an international community of authors, he founded PanAut Collective, a platform for visual narrative projects. In 2013 he interned at NOOR Images in Amsterdam and joined the iPad magazine About Photography as part of the editorial staff. He later moved to Rome where he worked as a project coordinator, co-curator and production assistant at 10b Photography until July 2014. His projects have been published and exhibited internationally. He is now based in Napoli and moving to Kurdistan to work at Metrography photo agency as a picture editor and project manager. Ioana Cîrlig (b. 1987, Romania) studied Cinematography in Bucharest. Since 2012 she has been working on independent long-term documentary projects and the Post-Industrial Stories project traveling around the country and documenting life in Romania’s mono industrial communities. Her photographs have been published in LensCulture, Inge Morath Magazine, F-Stop Magazine, Feature Shoot and Archivo. Her work has been exhibited in Romania (Bucharest, Cluj, Bistrita) and at the 2014 Architecture Biennale in Venice. Posted by Geoffrey Hiller in India. Dan Eckstein (b.1980, United States) spent four years studying photography at Skidmore College in the foothills of the Adirondacks. After graduation, he moved to New York City to assist renowned photographer Steve McCurry. He later worked with Magnum photographer Bruno Barbey in Paris. Dan’s work has been widely published and exhibited and he was included in The Collector’s Guide to Emerging Art Photography. 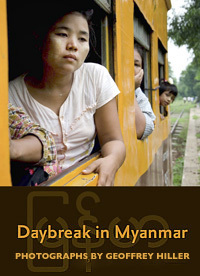 He was recently awarded Best Photo Essay in PDN’s World In Focus photo contest and included in American Photography 30. For Dan’s latest project, he drove 10,000km over the course of three years documenting the trucks, drivers and roadside culture of India. He is based in Los Angeles and Brooklyn, NY. Posted by Geoffrey Hiller in Estonia. Birgit Püve (b. 1978, Estonia) is a portrait and documentary photographer currently based in Tallinn, Estonia. Since she started working on her own personal projects, her works have won several awards. In 2012, the picture editors of The Sunday Times Magazine’s Spectrum, UK, named Birgit the Spectrum Emerging Talent. The initiative was launched to seek out today’s freshest photography.In November 2014 she won the 3rd Prize at the major international competition, The Taylor Wessing Photographic Portrait Prize organized by The National Portrait Gallery in London. Her works have been exhibited in USA, Canada, UK, Russia, Austria, Germany, France, Latvia, Poland etc and published in publications such as The Washington Post, TIME Lightbox, PDN Magazine, Der Spiegel, The Guardian, GEO, Ryanair Magazine, Newsweek Polska, L’Express, among others.Her first monograph “Elada mitmuses/Double Matters”, portraying more than 80 identical twins and triplets living in Estonia, was published in winter 2013. Annalisa Natali Murri (1982, Italy) approached architectural photography at the age of 27, while studying building engineering at Bologna University. During her PhD studies, she started to devote herself to photography with more conviction and interest. Soon she started to feel the need to focus on documentary projects, using her vacation time and savings to fund self-assignments and personal projects. Her works have been awarded in several international contests, including 70th and 71st POYi. In 2014 she was selected as an attendee for LOOK between mentorship program. She’s currently based in Bologna, Italy.